Above: My two new favorite erasers: dust-gathering (red), light-erasing (blue). I was recently ordering some of my favorite nibs. As every online retailer knows, I’m going to fill my cart to get the free shipping. So I still had a ways to go and noodled around the website thinking of all the future art supplies I could possibly need. The “dust-gathering” listing intrigued me so I clicked on this Pentel Ain eraser. Somehow, my scans are always covered in erasures that I fail to brush off before scanning — even when I think I really took my time and did a good job. When I see the scan it somehow looks diseased with all the microscopic debris leaving me with a lot of cleaning up to do in Photoshop. Excited by the possibility of a dust-gathering eraser, I thought, what more can I be missing? And then I found this Pentel Ain eraser described as “light-erasing”. Sometimes I get carried away erasing and press too hard trying to get rid of every stubborn pencil mark peeking out from under an inked line. Often times I damage the paper. When I tested this light-erasing one out I was amazed by how little pressure I needed to effectively remove the line without damaging the paper. I find the dust-gathering and light-erasing both do the trick. The dust-gathering really works, there are few clumps that are easy to brush away and often the clump just remains on the eraser head itself. Both erasers are inordinately better than any erasers I used in the past and I liked my old Staedtler! Oh and I also bought scissors with a special coating so they don’t get sticky and weird when you cut tape! Japan really is ahead of the game with these art tools! OMG! Thank you for sharing this! 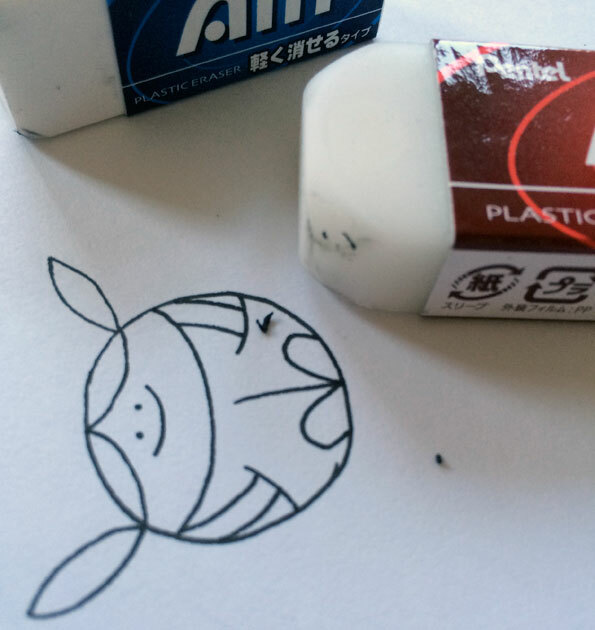 Erasers–because the devil is in the details! 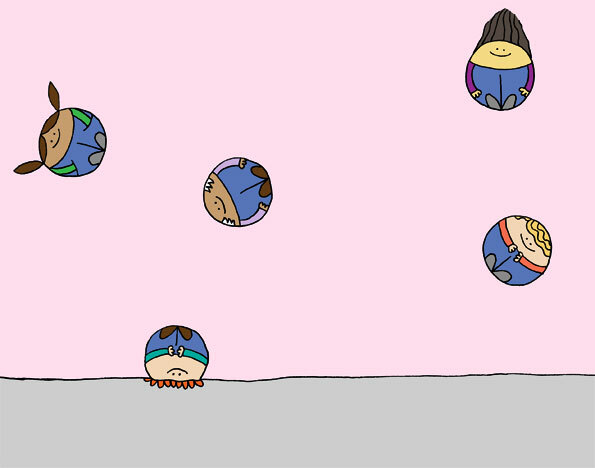 Also– your BOUNCE illo is very cute! Thanks, Dana! I was surprised by how much I loved them! It’s the little things that make a difference!